CLEANER, BETTER PERFORMING AND MORE USER FRIENDLY. The bold, swept-back face of the cover has a red three-dimensional beltline and a self-aligning hood for easy removal and replacement – no more wrestling matches. The double-wall upper cowling also helps to muffle engine noise better than any other outboard. The Evinrude E-TEC engines are compact and lightweight. Using state-of-the-art 3 D computer models, Bombardier Recreational Products specified “big motor” components to ensure best-in-class durability, quality and reliability in every engine. E-TEC engines optimize oil and gas consumption and create 80% less carbon monoxide than a 4-stroke engine creates at idle. Evinrude E-TEC engines use approximately 50% less oil than traditional direct injection systems and 75% less than traditional 2-strokes. A moulded foam inner liner. An air silencer. A Helmholtz resonator. An improved piston. An idle air bypass. An enhanced idle relief. E-TEC owners will immediately notice the whisper-quiet operation and what Bombardier Recreational Products calls a “signature sound” when on power. E-TEC engines need no scheduled maintenance, no dealer winterization, no spring tune-up for three years of normal recreational use. And, you never have to change the oil. The “sure start system” designed to fire within one revolution is controlled by the EMM onboard computer. The sealed fuel system is designed for long-term storage, as well as heavy-duty usage. The components are oversized for durability. The corrosion protection resists high temperatures. E-TEC is tough stuff. 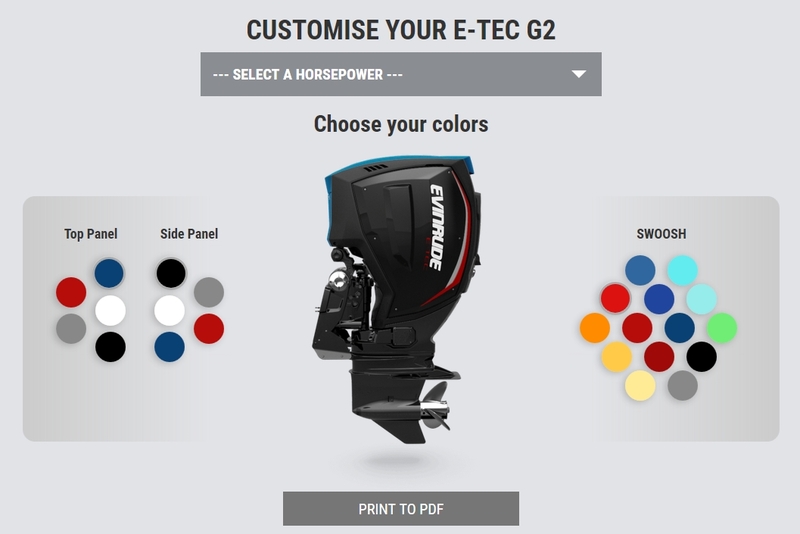 Learn more about the benefits and features of the new Evinrude E-TEC G2 and create an Evinrude E-TEC G2 color combination to perfectly match your boat.